Annunciator panels are being used in industry for many years to display Process Status and Alarms. They are now regaining popularity due to its non-dependence on any communication network. Electrocom offers wide range of Alarm annunciator system for online fault indication with sound output. our products are advance technology based and Ultra high intensity LED based Annunciator window comes in various sizes to satisfy different needs of client. This products is used in textile , chemical , pharma , cement , ceramic etc industry for supervisor control and monitoring. it replaces the electric annunciator which does the same function in compact design. Brand: Friction Free Instruments Pvt. Ltd. In order to fulfill the changing demands of our clients, we are offering a quality range of GE Intelligent Remote Annunciator Panels. Advanced technologies and quality raw material are used in designing and manufacturing these panels. These panels are widely used for remote monitoring and control of various equipment. Annunciator windows that we manufacture are available in standard white, red, yellow and green colors. These are available in various codes such as AW 5530, AW 7035, AW 7052, and are available in screw and snap types. 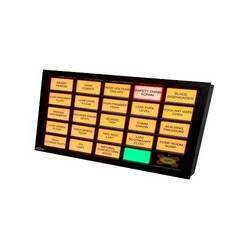 We are engaged in offering various Annunciator Panels which are widely appreciated by our esteemed clients. This panel is designed with the help of our diligent professionals, using premium quality raw material that is procured from authorized vendors of the market. 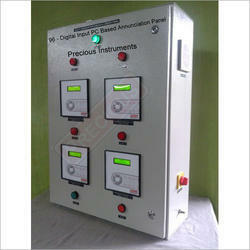 With state of the art micro-processor based annunciators.